A whimsical, mellow Airedale, Rafferty was with us for seven years before his sudden death in 1988. It was the process of making a memorial bench for Rafferty that inspired Tom, then a painter, to see with new eyes the bluestone that was everywhere on the property. The following year he began making stone sculpture and we launched a sculpture business called Rafferty Rocks. In time, the Spiral House was created as a stone sculpture large enough to live in and Tom’s Rainbow sculpture came to define the hillside above Rafferty’s Bench. How did an artist with no architectural experience get the inspiration and confidence to design and build a five-story spiral house made of stone? Can a home designed as sacred architecture be a comfortable place to live in the 21st century? And most importantly, how does living in a sacred space support one’s path to awakening? This is the story of artist Tom Gottsleben and his wife, Patty Livingston. 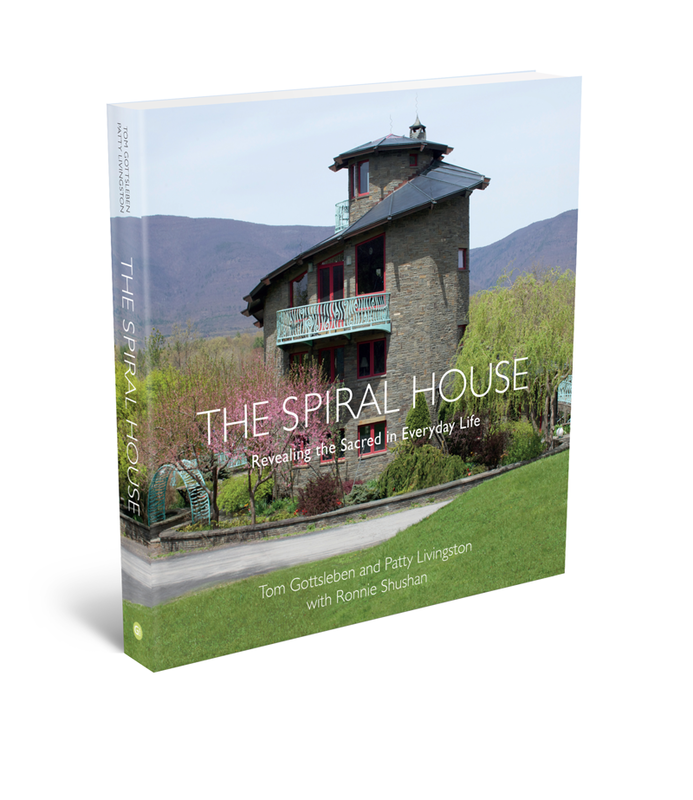 In three voices — his, hers, and theirs — the book tells the story of Tom’s years exploring stone sculpture and landscaping walls, his lifelong spiritual practice, his accidental discovery of sacred geometry, and how Patty’s pragmatic nature grounded the project in the practicalities of a comfortable home. Along the way, there is loss and rebirth, intuition and revelation, and a fresh way to understand sacred geometry and its relevance to our lives today. Although this is the personal story of one couple’s journey and their beautiful home and joyful approach to life, its purpose is to attune readers to seeing and creating sacred space in their own lives. Beautifully illustrated with photographs of the house, gardens, and sculpture, the book is informative, poetic, and inspirational. Throughout the building of the Spiral House, and ever since, the crew has gathered together to share a midday meal. When professional chef Diane Hagedorn began creating those meals, lunch jumped to a whole new level. Home-made nut cheeses. Wild Rice Soup. Spinach and Strawberry Salad. Cauliflower, Red Lentil, and Rhubarb Dahl. Smokey Beet Sliders. Quinoa Mushroom Risotto Cakes. Yum! By this time, the crew included artists and writers who produce Tom's exhibition publications, work on the many organic vegetable and flower gardens, and tend to the daily needs of such a large operation. 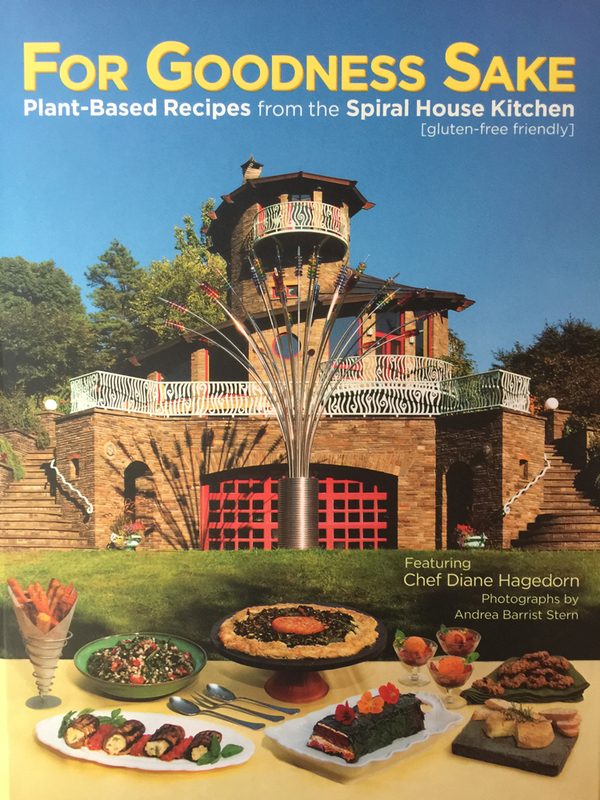 Given the delicious food and the publishing skills of some of the group, perhaps it was inevitable that we would create an all-vegan Spiral House cookbook. So from our kitchen to yours, we hope you'll enjoy this full-color, 288-page plant-based collection of our dishes. It includes some 140 recipes and 250 photographs of food that is good for you, good for life, and good for the planet. Among the recipes are those for comfort foods and fancy foods, holiday favorites and ethnic cuisines, savory bites and sweet treats, and dishes made with some of the best new plant-based substitutes for animal products. Most recipes are gluten-free. The book is also about community. "For Goodness Sake is filled with easy, nourishing meals that will fill your table with love and compassion. You'll find delicious versions of classic dishes along with new ideas that quickly become old favorites. Thank you Chef Diane Hagedorn. Bon appétit!" © Tom Gottsleben. All rights reserved.